Miss Evangeline Grey, intelligent and sensible, has no desire to marry, her reluctance born from the dire warnings of her overly emotional mother. Her father has other ideas, however, and decrees that unless she weds by the spring, he will choose a husband for her. Prim and proper Evangeline accepts her father's issue with little more than mild alarm. Knowing herself plain of face and sharp of tongue, she believes herself capable of warding off any perspective suitor. Her plan goes awry when the scandalous seducer, Mr. Thomas Masterson, visits her family's home, for Thomas has learned that he must procure a wife to receive his full inheritance. 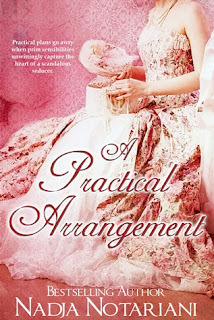 When he discovers Evangeline's predicament matches his own, Thomas determines to orchestrate a practical arrangement. A war of wit and word results, and Thomas finds himself ever more beguiled by the soft heart he discovers under Miss Grey's stern, inhibited exterior. Patiently, he endeavors to gain her respect and awaken her passions. As tenuous trust blooms between the rake and the reluctant, unfortunate events – and Thomas' past reputation – threaten to destroy the peace and happiness he has found within the bonds of his Practical Arrangement. Oh I liked this one. I love meddling families and the whole "forced" to marry storyline and Notariani really did a great job with it in A Practical Arrangement. And I gotta say, I loved that the scheme hit them both equally with each family laying down ultimatums instead of it all being one sided. Add in wonderful characters and a romance that completely gripped my heart and it made for one very content little reader. Evangeline and Thomas were nicely developed characters and complimented each other perfectly but still gave each other enough of a challenge to give the relationship a delicious little bite and make it even more enjoyable. It was delightful watching their reactions and how flustered they each got over the other. Evangeline not understanding actually wanting his touch. And poor Thomas, the rake, not having a clue what to do with a woman who doesn't swoon instantly over his charming ways. The banter between the two was entertaining and honestly they're people I couldn't help but love and that I truly wished would find their happily ever after. Evangeline was one of those heroines that won me over from nearly from the start. She's had a difficult childhood with a turbulent and unstable family life that's really damaged her emotionally and left her fearful of being intimate with anyone. Even a simple hug makes her extremely uncomfortable and puts her on edge. She's smart and capable and perfectly content to remain "on the shelf" and seeing her struggles with her father's ultimatum just broke my heart for her. All pretense of anger left her, her expression wary and awkward as it had been at the table earlier. Tension emanated from her still, stiff boxy, and she stared into her lap. Softly, she replied, "I wasn't ready." Confusion erupted in his thoughts. "Ready for what?" he asked gently. Her teeth began to chatter in earnest, but she sat, not speaking for a considerable span. Eyes averted, she breathed deeply, voice barely above a whisper. "For someone to touch me." And Thomas? He's a hero that'll make you proud. I loved that Thomas saw Evie. Really saw what she was going through with her family and how things affected her. That he defended her and tried to help ease her troubles and worries. The intimate moments between them were wonderful and had me falling for Thomas even more as he helped her through her fears of being touched and dealing with emotions she tried to avoid. It was really just nicely done. A Practical Arrangement really was a wonderful love story that won me over and had me wishing I could spend more time with Thomas and Evie. It has me pretty interested in seeing what Notariani comes up with next as well. through two widely different lenses. Within her titles, readers can find romance and adventure, from contemporary to paranormal to historical, always with a happily-ever-after. Nadja enjoys hearing from readers and can be found at her website, on Facebook, Goodreads, and at Romance Novel Center. Readers are welcome to contact her via email. 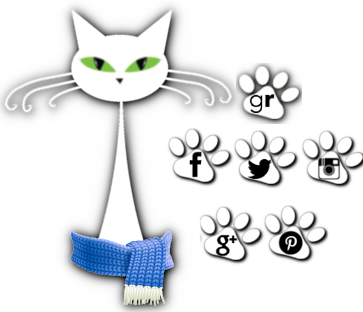 Alright kittens! 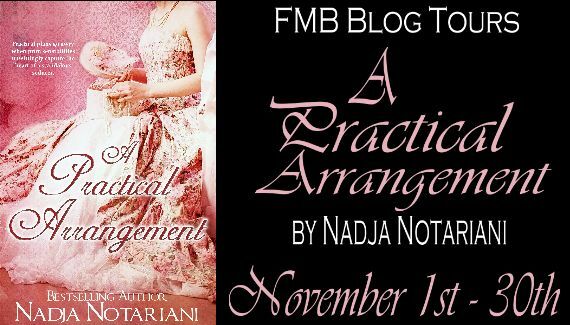 Here's a chance for you to win a copy of A Practical Arrangement. Just leave some love and fill out that Rafflecopter! What do you think of the "forced"/arranged marriage storylines? I always like them, provided they are not the mean ones. Where he or she is just downright mean to the other. Dont like that. Ooo yeah now that I wouldn't like. I did read one A Rogue by Any Other Name and it was a little rough. He really was quite a jerk for most of the book. I do like the ones where they're a bit snarky with each other but not the flat out mean on purpose ones. Forced marriage storylines just beg to be proven to sometimes be the best thing that ever happened! Thanks for the great review and sharing this book! You're welcome :) And yep. Definitely the case here. Loved how it turned out for these two :) Happy reading!